Companies’ dependency on email to do business brings with it various problems. Storage limitations, backups, problematic PST files, access to old emails and regulatory compliance or eDiscovery requests are a few issues that arise. Failure to address these effectively could have serious repercussions for the organization. 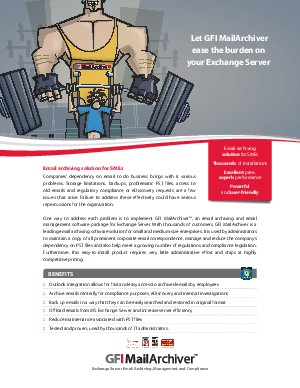 management software package for Exchange Server. With thousands of customers, GFI MailArchiver is a leading email archiving software solution for small and medium-size enterprises. It is used by administrators to maintain a copy of all prominent corporate email correspondence, manage and reduce the company’s dependency on PST files and also help meet a growing number of regulations and compliance legislation. Furthermore, this easy-to-install product requires very little administrative effort and ships at highly competitive pricing.